Madeleines are traditional French sponge cakes that are delicately shaped like petite shells, and they're absolutely perfect for dipping in fine teas. 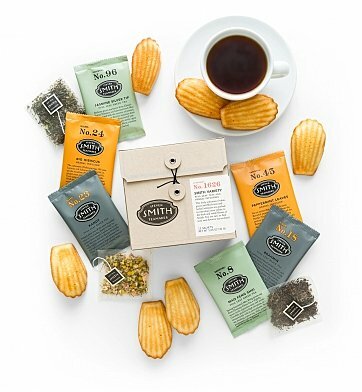 When paired with artisan teas from Steven Smith and arranged in our signature crate, this is a gift that every tea lover will be completely charmed by. One Variety Box of Steven Smith Teamaker Full Leaf and Herbal Teas. 10 Individually Wrapped French Madeleine Cookies from St. Michel. Your gift is arranged inside an enduring wooden crate with a sliding lid, securely packed to ensure a perfect arrival. A complimentary card with your personal message is included, as well as convenient scissors to easily open your gift. Measures 10" x 7" x 4". if ordered by 5:00 pm EDT Friday April 26th. Tea Time and Madeleines is a hand delivered gift. These gifts are delivered by one of our local design centers located throughout the United States and Canada. Same day delivery is available for most gifts when ordered before the cutoff time. The cutoff time for Tea Time and Madeleines is 2 PM in the recipient's time zone. Steven Smith Teamaker AssortmentTwelve satchets of Steven Smith's best, including Fez, White Petal, Mao Feng Shui, Jasmine, Brahmin, Bungalow, Kandy, Lord Bergamot, Big Hibiscus, Meadow, Peppermint and Red Nectar. Artisan full leaf teas and herbal-infusion teas from Steven Smith Teamaker. Twelve decadently soft and delicious French Madeleine cookies from St. Michel. Arrives presentation-ready in GiftTree's enduring signature crate. Received a phone call from cousin about her joy upon receiving your product after breast cancer surgery. And the quality of the crate amazed her too!. Jokingly told her she now as a place to stash her pearls, diamonds and emeralds when the crate is empty. Just the right gift, at the right time, during a very stressful health concern. Thank you! !